Girls Inc.’s program participants played a big role in helping the organization develop the idea for a coffee cart social enterprise. The business will teach teen girls valuable hands-on lessons in entrepreneurship while also generating revenue for the organization. Sometimes leadership means taking a chance on something new and innovative. That’s what eight Colorado nonprofits, a team of consultants and a handful of funders are collaborating to do through the Colorado Nonprofit Social Enterprise Exchange. “The Exchange” is a new program focused on helping Colorado nonprofit organizations build sustainable sources of funding and develop new jobs, specifically through the idea of social enterprise. While social enterprise isn’t a new concept, it is a difficult field for nonprofits to get into. According to Voyles, “studies show that many more nonprofits would explore social enterprise as a sustainable source of revenue if they had access to training and technical assistance. Voyles, together with Caryn Capriccioso and Rick Zwetsch of interSector Partners, L3C, created The Exchange to provide that support. The team is providing a variety of services, including an intensive eight-month social enterprise development program. A group of eight nonprofits is the first to go through the program. Since September 2013, they have been participating in hands-on planning workshops that have resulted in eight viable social enterprise ventures. Upon completion of the program in April 2014, they will proceed with implementation under a year of guidance. The Exchange is also exploring different sources of capital to seed or start-up these ventures. Girls Inc. of Metro Denver is one of the inaugural nonprofits. The organization offers educational programs for girls ages 6 to 18, and is developing a social enterprise that will not only expand programming, but also generate revenue. 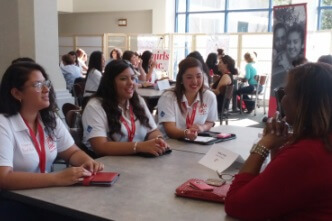 “The most beneficial part of The Exchange is having a process to work through – taking something from an idea and building it into an implementable plan,” explains Sonya Ulibarri, Girls Inc. president and CEO. Ulibarri and her team focused on social enterprise ideas for teen girls. “Teen girls want opportunities for leadership and to earn money – many of the girls we serve need to work,” says Ulibarri. Girls Inc. settled on a plan to run a coffee cart in a new library branch opening late 2014. The girls will earn money and learn entrepreneurship skills, the organization will generate revenue, and Ulibarri hopes to scale the social enterprise and offer it as a model to other Girls Inc. affiliates around the nation. Rose Community Foundation is proud to be a partner, funder and fiscal sponsor in this new program. Helping nonprofits build capacity and sustainability has long been a focus of ours, and The Exchange is an innovative and collaborative model for supporting that goal. We’re also excited about the opportunity it offers for others to get involved, from helping fund The Exchange, to sponsoring the next nonprofit group, to supporting the individual nonprofit ventures.